Do you miss Nestle Crunch Bars? I have always loved them. I have good news for you. I made a healthier version with these Quinoa Crunch Chocolate Bars. Not only are there zero refined sugars in my homemade chocolate bars, but there is also a boost of protein! You seriously need to try these asap. If you like this, you may also like my Homemade Junior Mints and my Homemade Twix Bars. Toasting the quinoa gives it such a nice crunch and also a nutty, rich flavor. 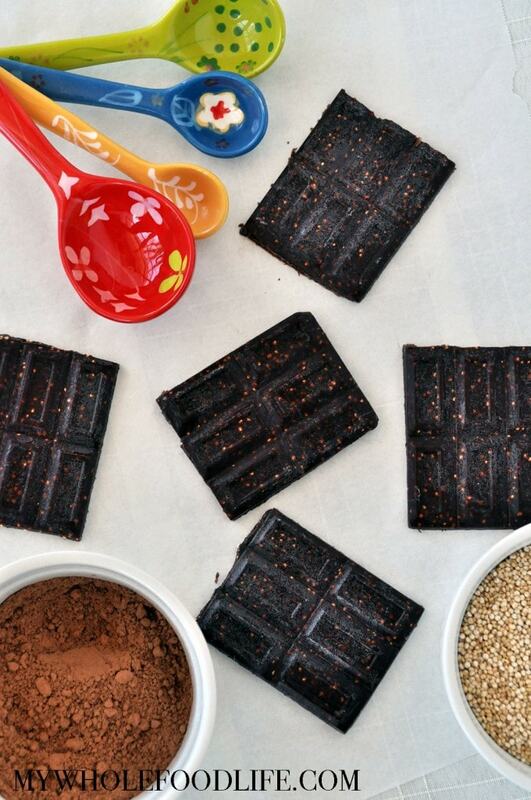 These healthier chocolate bars are vegan and gluten free. You can make them up in just a few minutes. Make these healthier chocolate crunch bars. Just takes a few minutes! To toast the quinoa, heat a saute pan or skillet on medium heat. Put the uncooked quinoa in the pan and stir often as it toasted. It should only take a minute or two to get it nice and toasted. In a large bowl , mix the coconut oil, cacao powder and maple syrup. Stir well. Add in the quinoa and stir until it's well incorporated. Pour onto a parchment lined baking sheet , or into chocolate molds . Please keep this chocolate stored in the freezer. It should last up to 6 months that way. Enjoy! Dumb question... Cooked or uncooked quinoa? No questions are dumb. :) Uncooked quinoa. Do you think I could use a smashed ripe banana instead of maple syrup? Maybe? The chocolate may end up too soft though. Stevia might be a better option if you were worried about the sugar. Sadly, no. The oil needs to solidify to make chocolate and I am not sure olive oil will do that. If you don't like the taste of coconut oil, you can use refined coconut oil. It has no coconut taste. What about substituting local, raw honey for maple syrup? That should work well too. Would cocoa powder work just as well? When serving, how long does it take to reach a suitable (for eating) temperature or can we serve/eat seconds after removing from the freezer? :-D How long does this keep? With these, you can eat them seconds from the freezer because they get melty fast. It should keep for up to 6 months in the freezer.